I had driven past Ponte Vecchio in Old Bridge for years but never actually gave it a try until last week. My friend was in the mood for seafood and since the place bills itself as a “Seafood Grill”, we figured it was worth a shot. The menu is an eclectic mix for an Italian restaurant. There is a raw bar and some unique appetizers as well as classic Italian fare and even a few steak entrees. The name of this joint is actually Italian for “Old Bridge”. The inside decor is quite beautiful and classy, and is a massive building with at least three different dining rooms from what I observed. We loaded up on crab for appetizers, getting the jump lump crab cocktail from the raw bar and an order of stuffed mushrooms, which also came stuffed with crab. For $12.95, there was a decent amount of crab in the cocktail. It was plump and juicy, coming served with sides of cocktail sauce and an excellent creamy mustard. There were a few pieces of shell we had to pick out, which I can guess can be expected if it’s fresh, although it threw us off a bit. The mushrooms were small but flavorful, though I probably would not order them again. 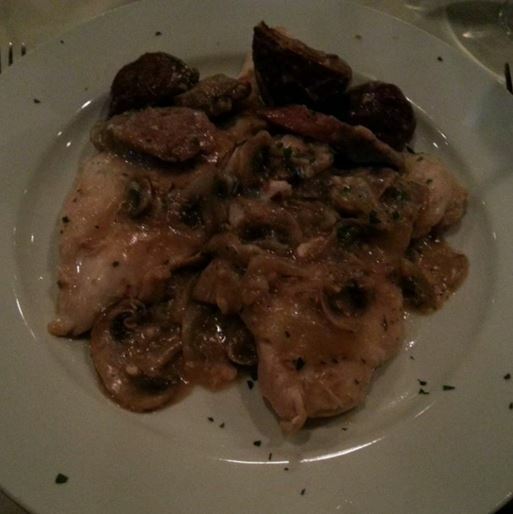 For the main course, I had the chicken giambotta. Don’t really have any complaints here. The serving was massive, containing three or four breasts of chicken, and topped with chunks of sausage, onions, mushrooms, and potatoes in a light sauce. The cutlets were thicker than I am used to, but were juicy and cooked to perfection. It was also supposed to have cherry peppers on top. Not being a fan of green peppers, I made mention of this and they did not give me any peppers at all. It was nice of them to err on the side of caution, though I am now wondering if I should have taken the chance and gotten them anyway. My friend had the grilled Atlantic salmon in a tomato basil sauce. He thought it was very good, but wished they had given more sauce because of how tasty it was. Overall, this was a fine dining experience but not quite at fine dining prices. Sure, if you went for a steak (I overheard the waiter telling the table next to us that the special steak that evening was $32.99) you might get there, but if you stick to classic Italian, you can have a nice dinner without breaking the bank. Would definitely go again, but probably only for a special occasion. 3 out of 5 stars. This review was previously posted here. Ponte Vecchio is located at 3863 Highway 516 in Old Bridge, New Jersey.